Fresh Vancouver Magazine offers today’s women and men the information and tools they need to feel beautiful, fresh, and ageless – inside and out. I love this unique publication for its focus on whole-body health, so imagine my excitement when Fresh Vancouver’s Editor in Chief invited me to have my raw food recipes featured in their uber-cool magazine. The feature is called Fresh Bites. In it I provided one raw food recipe for each meal of the day. For breakfast: Apple Granola (a raw version, of course). For lunch: a mock version of the classic Sloppy Joe, which I call the Sloppy Joy (opening up colorful commentary on YouTube – thank God for the screening function!). And for dinner: Five Minute Zucchini Pasta. 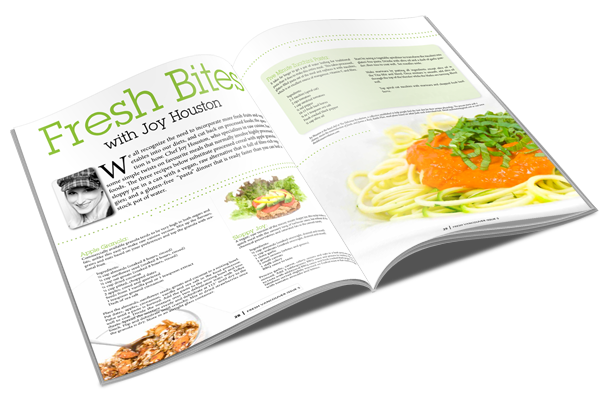 My goal was to give their readers a sample of easy ways to incorporate more fresh, live foods into their daily diets. You can check out the article by clicking HERE or on the image to the right. It Gets Better. I randomly got an email from Shelly Nellis, the Editor In Chief, that said she and her family loved the Five Minute Zucchini Pasta dinner recipe and were considering making a soup based on the marinara recipe because she enjoyed it so much she could eat it straight. Wow. Praise from the head of Vancouver’s finest quarterly magazine – yeah, that feels good. Thank you Shelly, for the opportunity to spread the word about easy ways to incorporate living foods, and for making room on your family table for my culinary creations. Are You ready to Ready to Go Raw too? I have a two week video course that makes it easy. Try living foods as a cleanse,or just to feel what life is like off all the processed foods we’ve grown accustomed to. If you’re like me you might like who you are on living foods a lot better than the version that shows up when you eat the Standard American Diet. I am loving the way I look and feel after switching to a high raw diet and I enjoy sharing the recipes and techniques I used to get this light, energetic feeling and Rocking Body. Check out my online raw food class to see if its for you. I’m not pushing my experience on anyone, so you can take the whole class and if you don’t like the food or don’t see or feel any change – cool. The refund is one button simple! Here is the invitation.